Every marketer knows that creating content is crucial. But as more and more content is written every day, the real problem is its distribution. Facebook, Twitter, and Instagram are flooded with content from brands. In this article, we are going to show you ten channels that are perfect for content distribution. We all share our content on Facebook. It is a great platform, full of users who are interested in quality content. However, Facebook Groups are being used by more users every day. This is why we recommend this channel. What and how to post? First of all, you will need to do some digging and find the right group (or groups) for your business, website, blog. Once you found it, make sure to read some of the posts to know exactly what the users expect. We recommend starting by commenting on posts that are relevant to your business, where you can insert a link to a blog post of yours. For instance, if you have a tech online shop find a group about gaming and respond to posts about the best gaming equipment. Leave a link to the best products for gaming available in your store. When it comes to Facebook Groups one of the challenges you might stumble upon is that the admin might remove you from the group if they see you post content only to grow your business. Also, it takes quite some time to find the right group for your business. The number of people who use Facebook Groups is growing every month. This means you are going to be able to attract more people to your website. Also, nowadays you can find a group for every niche. You might even be surprised to see what types of groups are on Facebook. If you think that this is the right channel for you, you can learn more about Facebook Groups here. You know LinkedIn, you use it every day. Despite this fact, many people don’t post their content there because they don’t think it could bring users back to their websites. However, LinkedIn is a growing community, you just need to find the right connections. It’s very simple to make your content known on LinkedIn. You can write blog posts, share a link to your article with a short description, and post content on niche communities that are relevant to you and your website. Also, if you wrote an article about an influencer or a public person who has a LinkedIn account, we recommend tagging that person when you share your content. They might respond or share your article on their page. It’s going to be hard to find connections on LinkedIn, especially people from your line of work or users who are interested in the type of content you intend to post. At first, when you have few connections, it’s highly unlikely that more than one user will come to your website or share your content. LinkedIn is a big platform, with thousands of accounts, many of them pros in their field so they might be great customers for you. Once you found the right connections, your content is going to be read, shared, and appreciated. Another underrated channel for content distribution is Quora. While some marketers are distributing their content here, most fear that they will get banned. However, if you follow certain guidelines, you won’t have any problems. When you create an account on Quora, you will be asked to complete your hobbies and interests. This is helpful because you will only see questions from those categories. Quora is a question-answer type of platform. Users ask different questions, and anyone can answer them. At first, we recommend asking a few questions, to see how people react to them. Once you got used to the platform, you can start to answer different questions. Just make sure that you give responses that are useful for the users. Don’t forget to include a link to your website (only if it is relevant). Most users who want to promote their business make the mistake of posting their content directly instead of answering questions. If you do this, you are going to get banned. Take it easy, learn more about the platform, ask a few questions, and then start answering questions. Quora is a new channel for content distribution. There is not that much competition as it is on Facebook or Twitter. Also, there are a lot of users on this platform, and you can select the topics that are of interest to you. Oh, good old Reddit! Marketers are starting to give Reddit a chance and to distribute content there. Just like the other channels we mentioned in this article, Reddit has many active users which increases your chance of success. Reddit works similar to Quora; people ask or post something on subreddits. Then, other users answer them, or they share their opinion on the post. First off, when you create your account, you will need to select some topics that are relevant to you. Also, you can follow specific subreddits. You can answer some questions that appear on your wall. Don’t try to change the topic or to respond with a simple link to your website. Just like on Quora, you will get banned! Include links to your website only when you think that it is relevant. If you are interested in Reddit, you can check out Ross Simmonds. He provides tips and tricks for content distribution on many channels, including Reddit. Getting banned is the main problem on Reddit. Also, finding the right audience for your content might be difficult. Since you can only answer questions at first, you will need to check every day to see if there is a relevant topic for your content. Old platform (13 years) with a growing audience. Reddit also has a lot of topics and interesting subreddits which means every website has a chance to stand out here. Imgur is another platform that is waiting for your content. Most of the posts on Imgur revolve around amazing visuals. However, written content is also accepted as long as there is a picture or a GIF included. This is a great platform for content repurposing. If you have an article, you can remake it into an interesting piece of content filled with images and GIFs. Search for topics that are relevant to your business, study the types of content that are well-received by Imgur and its users. Then, follow that model and write your own original content. Include a link to your website for more details. The fact that it is a visual-oriented platform makes it hard for copywriters to make their content known. However, using visuals increases the impact! Imgur has over 250 million active users every month. Also, you don’t have to panic that you will get banned if you posted a simple photo and a description. However, like on other websites, you can’t use certain words or offend other users with your content. Unlike the other channels presented in this article, Stack Exchange is an entire network. On Stack Exchange, you will find content from various websites, including Stack Overflow which we will introduce later. Like Quora and Reddit, this is a Q and A platform. It doesn’t come with strict rules, but you need to search the question before you post it. If you post a question that has been asked and answered, your content will be removed from the platform. On this network, you will find different websites, and each one is specialized on a specific topic. Make sure to post your question on the right website to avoid getting banned. Finding the right website for your content might seem a bit tricky. However, with a simple search, you can see the top sites (Stack Overflow, Ask Ubuntu). Also, you can search by category to make sure that you find a place for your content. One of the main advantages of Stack Exchange is that you can find various websites, each one of them specialized on some topic. It is more organized than Quora and less strict than Reddit. This is a dream for any content marketer in the world. It is a special community for bloggers, writers, and journalists. As its name states it, Triberr is made from different small groups known as tribes. You can follow as many tribes as you like. Each tribe is destined for a specific category like marketing, business, blogging. Once you join different tribes that are relevant to your business, you can start to post quality content which includes blog articles, news articles, tips and tricks, guides. At first, it will seem like nobody is reading your content. However, you will have to join several tribes before you see results. Take a quick tour and see what others in your tribes are posting to see exactly what you need to post. It is simple to use, you can post almost any type of content, and you will also meet a lot of people from your field of work. Scoop.it is another community perfectly designed for content marketers and bloggers. Once you register, you will need to choose the topic that is relevant for your business. You can opt for a free plan (with fewer features) or for any of their paid plans. We suggest a month or two for free to see if Scoop.it is the right community for you. Just like Triberr, you can post pretty much any type of content. You can also share it directly from your website. When people click the description, Triberr will redirect them to your website. On this platform, the most important thing to focus on is the title. The description is also an important piece, but we suggest 100% focus on the title. Learning how to navigate the website. Unlike the other platforms, this is not so user-friendly. You can distribute content from other bloggers and include a link to your articles on the subject. It is a lot of quality content posted on Scoop.it, and it will be easier for you to collect information. Stack Overflow is one of the websites from Stack Exchange. This website is designed for people who are passionate about the IT sector. There you will find a lot of discussion on tech, programming, and other similar subjects. Since it is an important part of Stack Exchange, you will need to follow the same rules. Ask or answer a question on IT. Don’t post anything that is not related to the subject or your content will be deleted. When you post an answer, make sure to include a link to your website if you have more information there. It only focuses on a sector instead of letting users post different types of questions. However, you can use Stack Exchange if you don’t have any IT-related content. There are a lot of experts in the field who can help you find out more about the IT sector. Also, there is a “Looking for a job” column for people who want a job in tech. As you might expect, this platform revolves around Bitcoin and blockchain technologies. There are different topics where you can post your content, but all of them are related to virtual coins. It is the perfect place to learn more about the latest cryptocurrencies or to post links to your website (if it is about a virtual coin). You can select a topic and then a subject. There, you can see anything that was posted and commented by the others. You can make another subject on that topic and start a conversation about a problem you stumbled upon when buying cryptocurrency or a way to help beginners in this field. Include links to your website only when they are relevant to the topic. It is only designed for blockchain talks. Even the discussion on Politics and Economics revolve around this cryptocurrency. You can’t post any content that it’s not related to the subject. You’ll need some HTML skills or some experience with publishing on forums as the interface is not that user-friendly. For those who work with blockchain projects and need to gather interest around their startup,, this is the best forum on the topic. You can gain quite some traction from here. Content distribution is the one you should focus on from now on. Facebook, Twitter, and Instagram are filled with paid ads, posters, links, and articles. This means the competition is too big and your chances for success are pretty small. 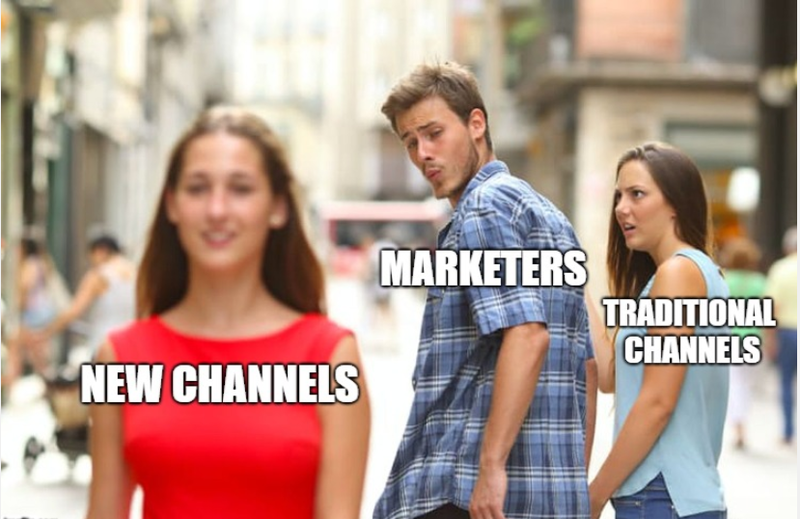 However, turning your attention towards other channels (like Reddit, Stack Exchange, Triberr) is a great way of increasing traffic on your website.